I tend to keep a list of bands and albums I should check out. Sometimes those bands stay on that list for embarrassingly long times before I actually get myself to check them out. Bosnian Rainbows is one of those bands. A couple of weeks ago I did finally decide to give their self-titled debut LP a spin and well, it was love at first listen. Bosnian Rainbows is an American alt-rock group that was formed after the less-than-amicable breakup of The Mars Volta. Originally starting as a continuation of Omar Rodríguez-López's side project, the line-up - consisting of previous The Mars Volta members Rodríguez-López and Deantoni Parks, singer Teri Gender from the Mexican punk group Le Butcherettes and keyboardist Nicci Kasper - soon became a band of its own. They released their first album, the eponymous Bosnian Rainbows last summer, and they've already finished their second album as well. Unlike the first LP, the second one will be in Spanish though. This mixture of styles makes an interesting cocktail of sound: whereas The Mars Volta's music is highly progressive - even a bit too progressive for my personal liking - Bosnian Rainbows' music is more straightforward in the sense that the songs are shorter and more to-the-point, as pointed out by Rodríguez-López himself. Also, while The Mars Volta is renown for its experimental prog rock and Le Butcherettes played garage-y punk rock, Bosnian Rainbows can best be described as post-punk, interestingly enough.
" --- it’s all the same influences that have been in most of my writing and all the people in my bands’ writing. Can is there, Siouxsie and the Banshees is there, Gang of Four is there, all the Led Zeppelin, whatever… (---) The very melodic side of Can; the very textural side of Siouxsie." Having read that, I can also hear the other bands in their music, especially the German krautrock band Can. But you can easily point out that the Banshees have had a major influence on the project - the guitarwork on several songs bears a similarity to the McKay/McGeoch era Banshees (such as on "Torn Maps" or "Eli" which sounds like a modern-day cousin of Join Hands track "Premature Burial") while Teri Gender Bender's vocals occasionally parallel those of Siouxsie, most notably on the claustrophobic "Cry For You". The post-punk-meets-alt-rock approach also recalls that of another American Siouxsie-esque group, Yeah Yeah Yeahs. But on the record they rise above being a mere post-punk pastiche, creating a sound of their own. The dramatic album opener "Eli" is a slowly unfolding five-and-a-half minute piece of theatrical angst with lyrics that describe a torn family and the forgiveness of parental love: "I've been so cruel, mother of mine / I've been so cruel to you / So why do you smile at me?". The lyrically slightly disturbing "Dig Right In Me" is another fine example, mixing Rodríguez-López's distinctive guitarwork with '90s alt-rock-ish arrangements with catchy results. On the cryptic "The Eye Fell In Love" the group returns to more typically dark post-punk before amping up the gloom on the turbulent "Cry For You" - well, what else can you expect when the track opens with an angry guitar riff and such ominous lines: "I pick three flowers from you grave / They taste like velvet after days". Things mellow down slightly on "Morning Sickness", though it still retains lots of that angst with its lyrics describing a poisonous love relationship: "All I can say is I blame you for loving me / All I can say is I blame you, blame you / For all the hurting / By this emptiness". The song is also rich in infectious guitar hooks. The lead single "Torn Maps" is a more uptempo affair and, in my opinion, a quite peculiar choice for the first single to be released. It is the track that most recalls Bosnian Rainbows' personal influences and it's got the Banshees written all over it. Seriously, it sounds like Siouxsie dropped a tab of acid and decided to cover a Can song. Which is obviously every bit as amazing as it sounds but still, hardly the most representative or original-sounding Bosnian Rainbows song out of the bunch (unlike, say, "Eli" would've been). The second single "Turtle Neck", however, is simply fantastic. It begins as a '90s-reminiscent shoegaze number but introduces a mid-song change in tempo and style, bringing some of the guitarist's trademark progressiveness into this song before ultimately returning to its initial shoegaze sound on its outro. "Always On The Run" is one of the more rock-oriented tracks and another album high point, as is the following song, the terrific synth-laden "Red" which features the most instantly captivating intro on the album. The group finally bows out with the incredible and sentimental nearly seven-minute album closer "Mother, Father, Set Us Free" which fades out with the same organ-like synths that open up the album. It's a lovely touch, making the album feel like a full circle of a ride (a point that is further emphasised in its family-relating lyrics, like those of "Eli"). Bosnian Rainbows is an extremely solid album. The only song that feels a bit 'meh' is "Worthless" which isn't really that bad as such but simply doesn't offer as much of a thrill as the rest of the tracks. The lyrics can be rather melodramatic at times but Teri Gender Bender's passionate vocals match them perfectly. And while the band's influences can easily be traced back to certain groups, the songs don't seek to replicate the style of their predecessors but rather give their own spin to these inspirations. It certainly works well: the band sounds modern and innovative while still remaining true to its roots. 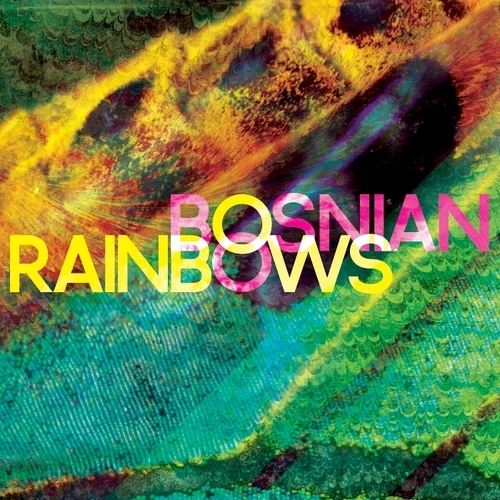 Bosnian Rainbows is quite simply one of the better post-punk revival albums out there. Try at least: "Eli", "Dig Right In Me", "Turtle Neck", "Red"